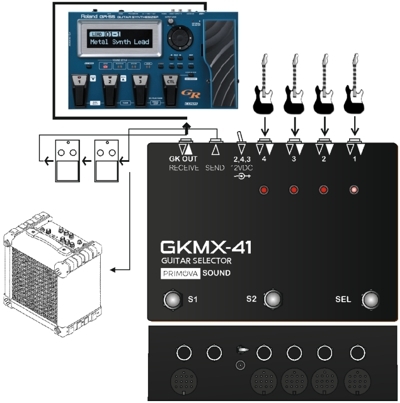 " Four Guitars to One Synth "
GKMX-41 is a four-channel switching device for 13-pin GK equipped guitars as well as Standard guitars. The unit allow you to quickly grab a new guitar, hit the foot switch and take off with the next song. The unit is made for stage use and is sturdy and within a small footprint (170x120 mm). 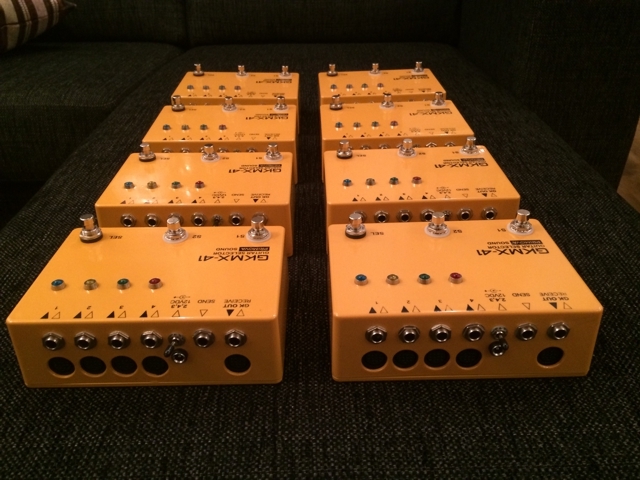 GKMX-41 even allows you to send S1 and S2 commands using footswitches even if a regular (non-GK) guitar is selected. You may also use the device as a regular guitar switcher and play directly through your guitar amplifier using the SEND jack (requires a 12VDC adapter). GK OUT GK output connector for Roland GR-33, GR-55, VG-99, GR-D, GR-S or other compatible 13-pin synthesizer. 12VDC The unit is powered by the synth or by an external 0.8-1.5 Ampere 12 VDC adapter (not included). If more than two 13-pin guitars are connected and you are unsure about the power consumptions we strongly recommend using an external adapter.